The Spirit in the Glass is Sweden’s version of a Ouija Board. Teenagers mostly participate in this activity. A large piece of paper or cardboard is used as the surface. A glass is used as a template to draw circles, within these circles are placed the letters of the alphabet and the numbers 0-9. The words: Yes, No, I Don’t Know, Start and Finish are written as well. This glass is then used as the plancette. Before starting this glass must be warmed up. The teens do this by rubbing it between their hands, breathing on it, or warming it with a candle that has been lit. It is warned that this activity should never be done in a room that has mirrors for the spirit can appear within this mirror--which will upset it. This spirit then will shatter the mirror into pieces. The teens place The Spirit in the Glass in a dark room with only candles for light. The young participants after warming the glass take turns asking a question by placing the open rim of the glass next to their mouths and whispering their question. It is then placed open rim down on the paper. The participants place their fingers on the bottom of the glass as the answer is spelled out. If no answer is given the glass usually just tips over. One legend is told about a young man who broke one of these rules. He asked when he would die--the glass moved to the number “4” and then to the number “0”--so 40 years old. Eerily years later to the day he died when he committed suicide by hanging himself at the age of 40. Black Madame is the Swedish version of “Bloody Mary.” But “Swedish children are more dismissive of spirits” so their version of this game is not as scary. Yet another version involves them chanting into a bathroom mirror “Black Madame, Black Madame, daughter of the devil show yourself.” As they chant this phrase they splash water on the mirror. This chanting is most often done on a “dare” just like Bloody Mary. 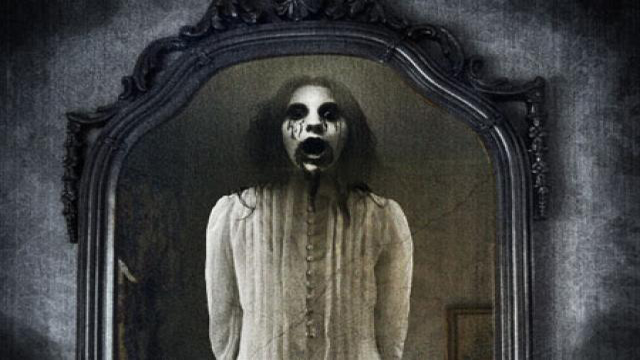 If Black Madame appears in the mirror it is said she has green hair, red teeth and luminous yellow eyes. Other names for her include: Bloody Black Madame, White Madame, Dirty Madame and Creepy Madame. In the 1970s some Swedish children adopted the European names of “Mary” and “Black Molly”--but the term Svarta Madame is still used widely in Sweden. The Cimetière du Père Lachaise located on a hill overlooking Paris is visited more than any other cemetery in the world. The reason for this is twofold. 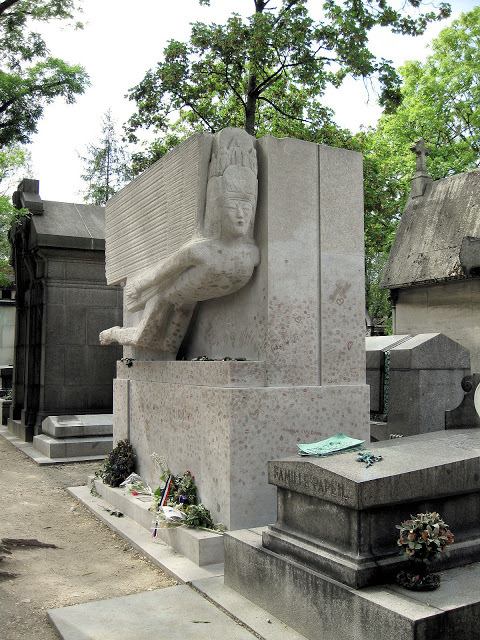 This cemetery is the final resting place for a large number of famous creative, talented people plus the cemetery has some of the most spectacular, beautiful, macabre and sad gravestones, tombs, sculptures and mausoleums of any found in the world. Burials in this Paris suburb began in 1804 and today 200 years later the Père Lachaise has over 1 million graves. The cemetery still accepts new burials but it has a long waiting list. The reason for this is limited space so graves are “leased” for 10, 20, 30 years, etc. When the family stops paying the remains are removed to a different cemetery so space can be reused. Balzac--writer, Karel Appel--painter, Isadora Duncan--dancer, Rosalie Duthè--courtesan, Sarah Bernhardt--actress, Frederic Chopin--composer, Molière--playwright, Jean de la Fontaine--poet/fable writer. Marcel Marceau--mime, Jim Morrison--singer, Marcel Proust--writer, Gioachino Rossini--composer, Oscar Wilde--writer, Georges Bizet--composer/conductor, Georges Rodenbach--poet, Edith Piaf--singer, Gertrude Stein--writer, Eugene Delacroix--painter. kisses left by admiring women. 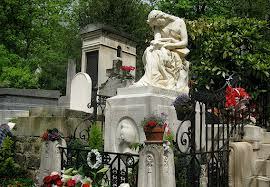 People who have visited Père Lachaise often mention the ghosts they have encountered along its shaded cobblestone paths. One story mentions Marcel Proust and Maurice Ravel. They were a loving couple in life -- it is said they rise at night from their graves and go in search of each other. Adolphe Thiers who was the prime minister under King Louis-Phillippe in the 19th century is said to “tug” on visitors clothes if they venture too close to his resting place. 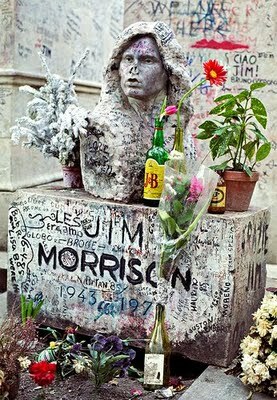 The Doors lead singer Jim Morrison is often seen roaming near his grave. His grave was almost the victim of the cemeteries “lease” policy when families that have deceased loved ones near his resting place gathered together when the Morrison 10 year lease was up and tried to have him moved--they did not succeed. The bust which was placed on the 10th anniversary by a fan was later stolen. The family pays to have the graffiti cleaned off. 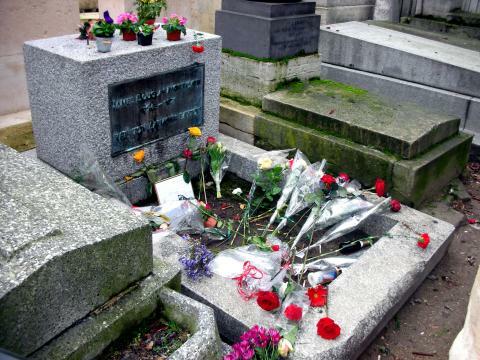 Recent photo of his grave. There are also many other stories of visitors seeing spectral lights, translucent figures, and other disembodied spirits roaming throughout the cemetery. 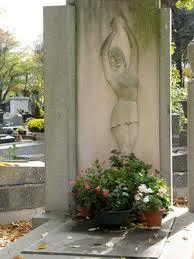 The following is a 5-minute montage of pictures of the various incredible grave markers at Père Lachaise. 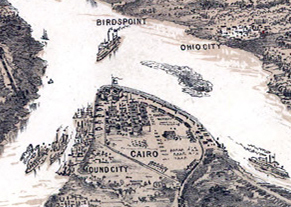 Cairo, Illinois known as the City Between Two Rivers lies at the junction where the Ohio and Mississippi Rivers meet. 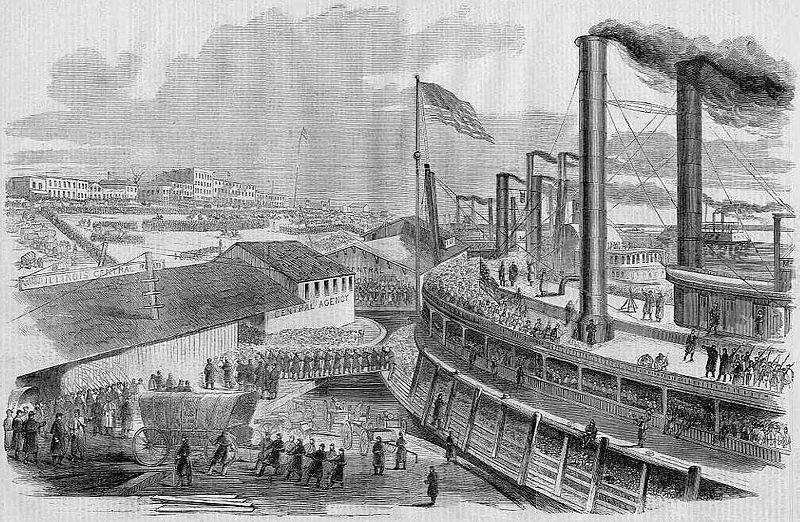 This town first rose to prominence in the early 1800s as a bustling steamboat port. Later during the Civil War it was used as a site to train Union troops. With the decline of the river traffic in the early 1900s both Cairo’s economy and population were drastically impacted. Today the town represents stark contrasts. 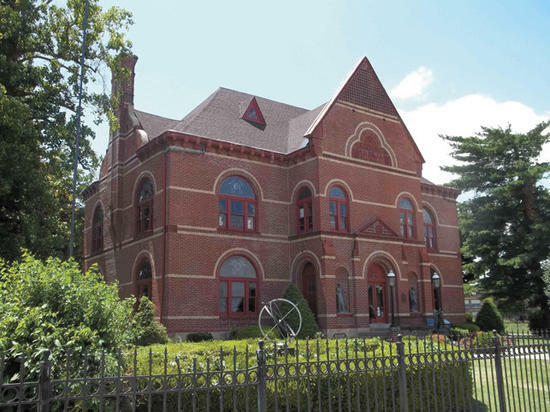 On one side is the many elegant Victorian mansions that are listed on the National Register of Historic Places on the other side is a town that is struggling to survive. One shining bright spot is the Cairo Public Library. The building that houses this library is the Safford Memorial Building. A widow, Mrs. Alfred Safford presented this building to the town in 1884 in fond remembrance of her late husband. The Cairo Women’s Club and the Library Association contributed 1500 books in exchange for the use of a room for their meetings. Today the library has over 41,000 books in its collection. This old red brick Queen Ann building still retains most of its original charm. It is adorned with original stain-glass windows and it displays a rare Tiffany clock on one stair landing. A chandelier that hangs in the library once hung in the Cairo Opera House. Many of the original ornate bookshelves remain. The adult reading room contains a large round table that once was a gaming table on a steamboat. In 1962 and 1984 improvements were made to the library with an addition of a stack room and special collections room. Another item that has always remained the same about this library is its resident ghost. For years, the employees of the library have seen and heard very unusual things, which cannot be easily explained. Louise Ogg, a librarian nicknamed this ghost, Toby. Ogg actually encountered Toby on the first day she worked in the library. She was on her lunch break when she heard the sound of a rocking chair in the reading room. When she went to investigate the sound stopped but as she returned to her desk she heard the rocking chair once more. Many others have heard similar noises in this room. Just weeks later Ogg and a colleague again on lunch break spotted a strange white light that appeared from behind the front desk. These two ladies watched as this bright light ascended from the desk and slowly passed the office. It then disappeared among the stacks. Several librarians over the years have taken ownership of this ghost to feel more at ease around it. They often state Toby was a former patron of the library who just can’t bear to leave the place--for they are sure he has fond memories of the pleasant hours he spent reading in the building. 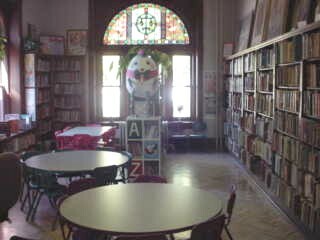 One library director, Monica Smith also encountered the ghost. It seems Toby likes to play games for Smith often after turning the lights off would find that they were back on in various rooms. She also on several occasions heard footsteps upstairs when she knew she was the only one in the building. Back in the days when the library still used card catalogs the librarians would often find these cards mixed up directly after they had been checked. One interior door at the back of one room often opens and closes when no one is around. This phenomenon has been reported many times over the years.